One of downtown Minneapolis’ most prominent buildings has another fast-casual lunch option. 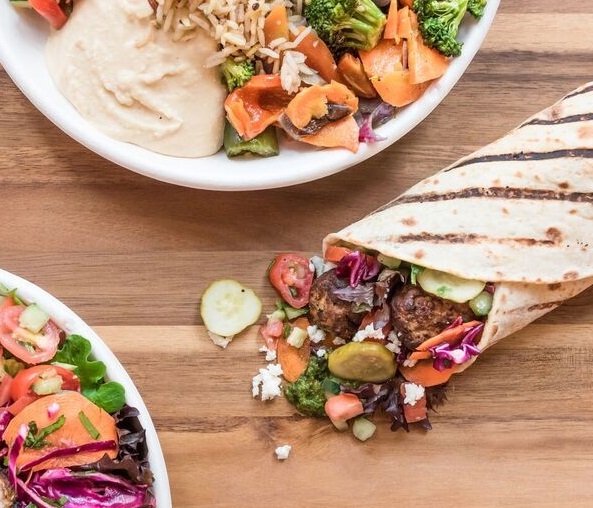 Roti Modern Mediterranean, a Chicago-based chain, opened its first Minnesota location on Wednesday, with the line flowing out into the IDS Center’s Crystal Court. The Chipotle-style setup touts customizable meals – salads, rice plates, sandwiches or wraps – that feature proteins such as spicy lamb meatballs, falafel, steak, chicken and salmon kabobs topped with various pickled vegetables, salads and sauces. Gluten-free options, including pita bread, served warm, abound. Roti, which has 30 outlets in all (in six states plus the District of Columbia), replaces Cosi in the IDS ground floor space.